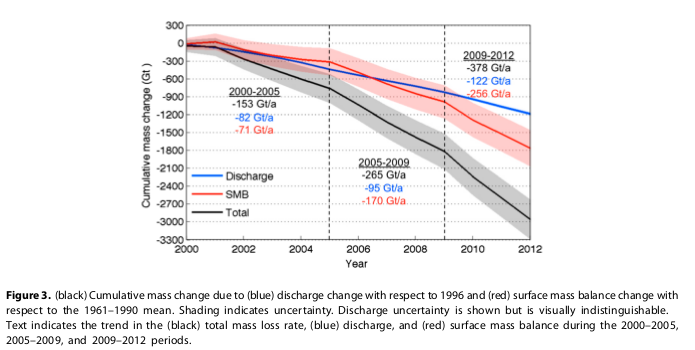 For reference, 360 GTonne of mass loss results in 1 mm sea level rise. 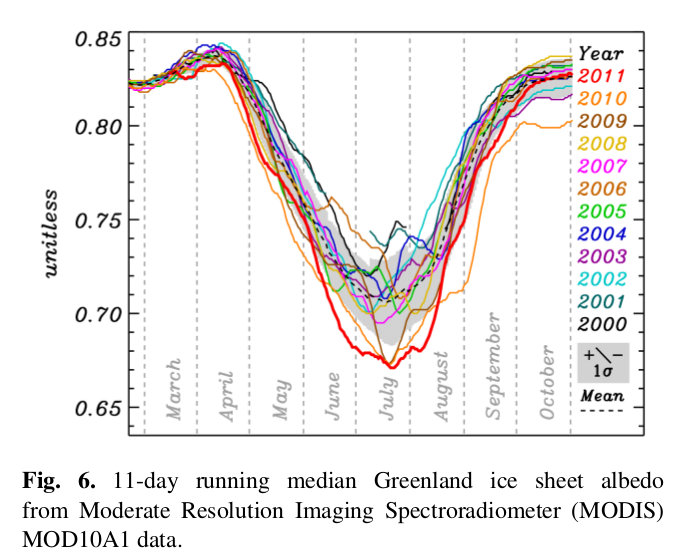 Greenland lost more than that in 2012 alone. Note Jacobshawn in the west and the great double snouted North East Greenland Ice Stream. Note the sectors in the Amundsen sea, and to a lesser extent, near Totten. These ice shelves hold back inland ice, and as the disappear, ice flow inland accelerates. 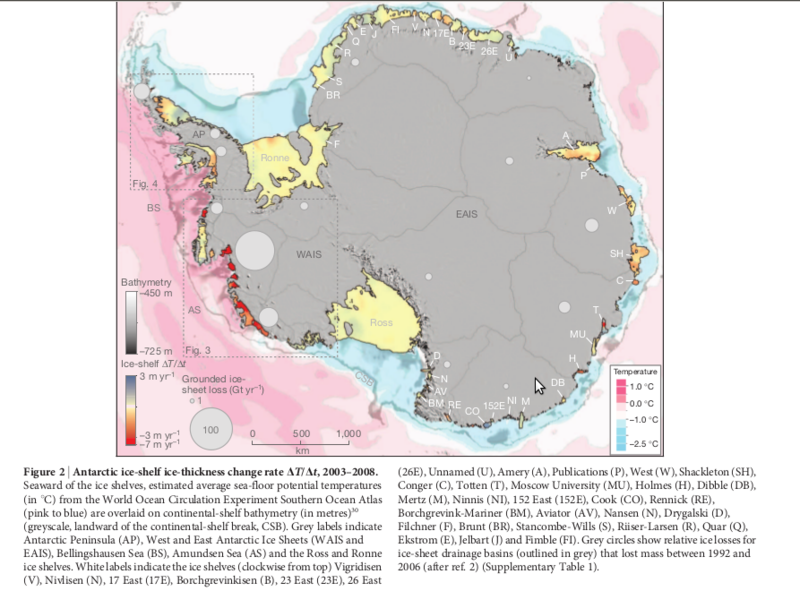 As Pritchard et al.,"Antarctic ice-sheet loss driven by basal melting of ice shelves,"Nature, 16 April 2012, v484, pp502 et seq., doi:10.1038/nature10968 put it: "Every case of ocean-driven ice-shelf thinning that we identify is linked with previously documented dynamic thinning of grounded, fast-flowing tributary glaciers ..." Indeed, as they show in Fig. 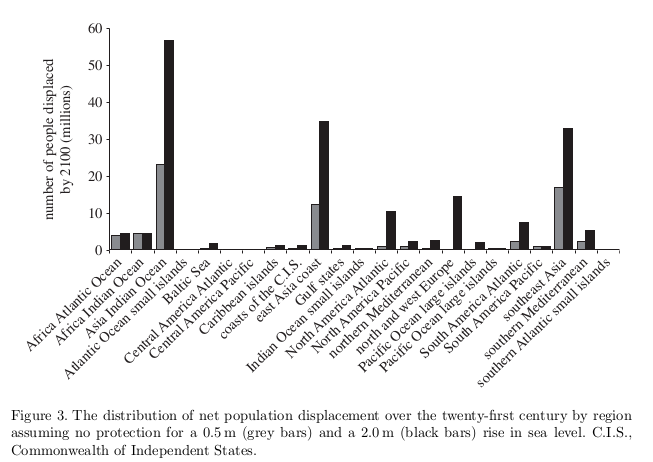 2 below, the greatest inland ice mass loss is in regions fringed by rapidly melting ice shelves. There is a key feature in the bathymetry depicted above: the rapidly thinning shelves are adjacent to deep troughs in the ocean bottom, that allow incursions of relatively warm Circumpolar Deep Water which cause basal melt. Note the steady decline. Prof. Box is now investigating soot from North American wildfires as a factor in the darkening of Greenland. 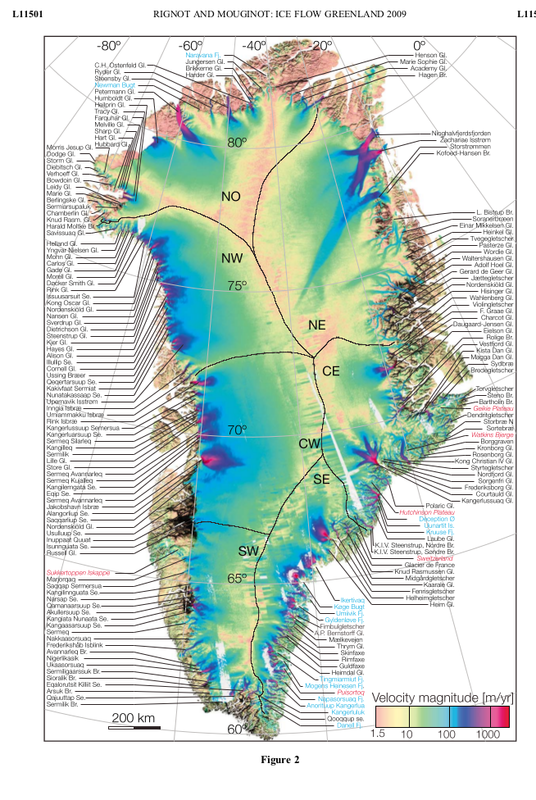 Some more information on Greenland albedo and the extraordinary melt in 2012 may be found here. 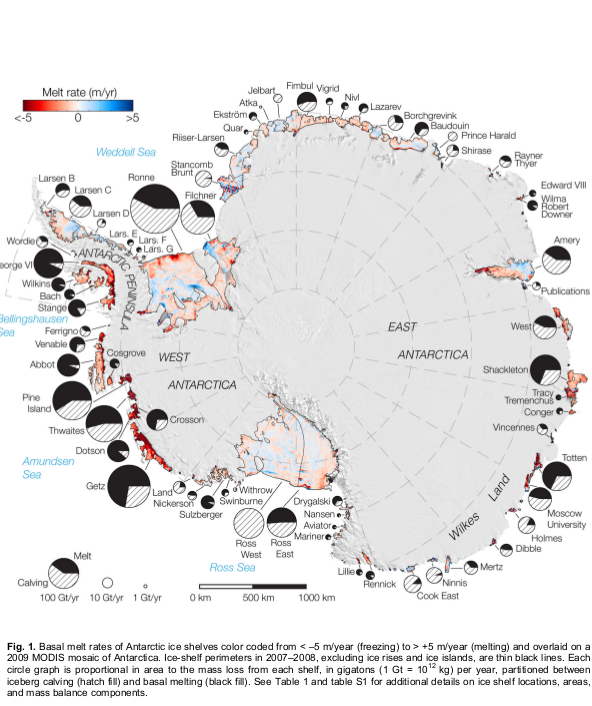 whereas in Antarctica basal melting is more important. 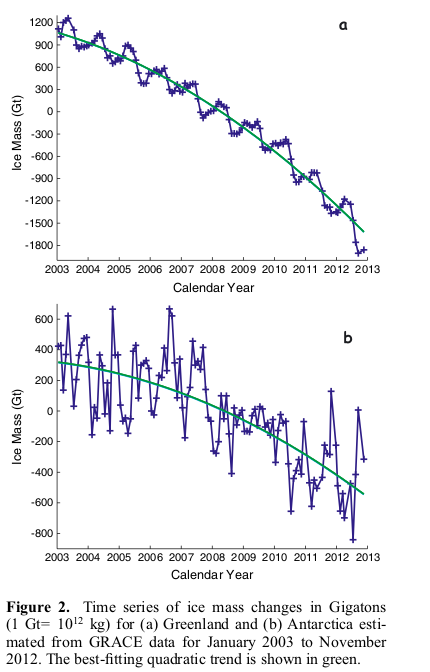 In both cases, major ice streams toward the ocean have accelerated. The result is an addition of water to the world oceans, which raises sea level. The rate of increase of mass waste from the two major ice sheets is therefore a question of great importance, for while we might easily deal with a small rate of sea level rise, we would face more and more difficulty as that rate increased. Current projections of the fate of these two icesheets are uncertain. Projections using linear, semi-empirical models project a range of 0.5 to 2 meters by 2100. These do not and cannot take into account nonlinear processes destabilizing the ice sheets.